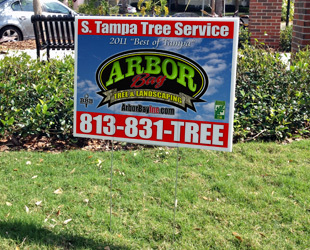 Use our yard signs to spread the word about your business, product, or service. 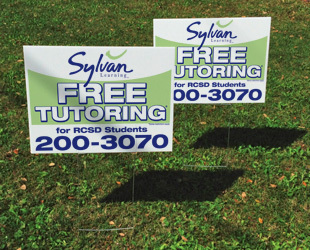 Good Guys Signs' yard signs are affordable and effective! 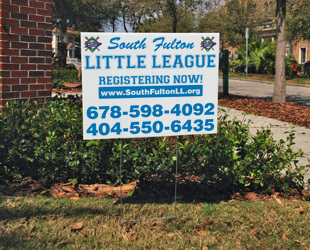 Corrugated Yard Signs, also known as Corrugated Plastic Signs, are the solution to your cheap sign needs. Corrugated yard signs are great for long term and short term use. Constructed of rugged and weather resistant corrugated plastic (coroplast), our yard signs can be printed in any colors you desire. 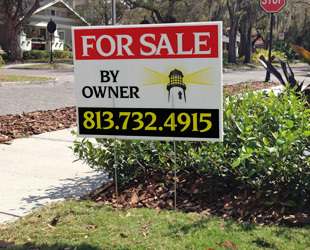 Cheap 1-color yard signs are often used for new businesses to get the word out. Also, cheap yard signs can be used for promoting a church event, or a party or other gathering. 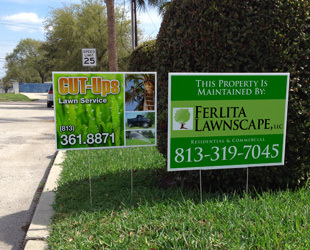 Yard signs can be 1-color, multiple colored yard signs, or even full color yard signs. Full color yard signs are used when photographs tell the story better than words. When choosing a company to make your full color yard signs, choose a digital printer like Good Guys Signs to execute your yard signs perfectly. Corrugated Plastic's is very durable outside for lawn signs, yard signs and political signs. Some people call them bandit signs. Corrugated plastic is aligned with flutes that run vertically on the sign to allow sign stakes to be inserted in the flutes. Yard signs come in many sizes. A popular size for yard signs is 18 x 24 yard signs. Some people prefer a smaller sign, and select 12 x 18 yard signs for their project. For political campaigns, 4 x 8 Yard Signs are used to make a big impression. Colorful palettes, a variety of sizes and printing options and affordability make our coroplast yard signs a must-have component to include in your local advertising campaigns. We have a top-notch team of design, marketing and printing experts ready to serve you - and we possess the top of the line graphic design programs and printing equipment to produce your signs in-house and in just about no time at all. We provide superior service and superior products all over the United States. Good Guys Signs can design your yard signs. You have talented designers to design your entire yard sign campaign. When you have the idea for your bandit signs, but do not have high-quality graphics software, you have found the right place. We will create a design that raises awareness effectively. Clutter is bad with yard signs. Careful layout and one main message are the best ways to make your bandit sign campaign deliver great results. 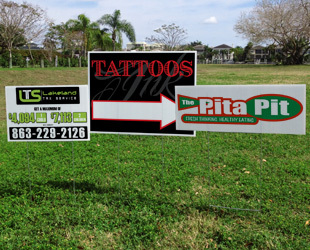 On top of great yard signs, Good Guys Signs has the right stake for your needs. Our 30 inch sturdy stakes are our most popular size. We also carry spyder stakes, which last longer in poor weather condition. 15 inch stakes are the economy option. We also have rider pins for those who want to place one image on top of another. When you need stakes for your yard signs, Good Guys Signs has plenty of yard sign stakes in stock for all of your needs. Whether you call them yard signs, cheap signs, plastic signs, throwaway signs, or bandit signs, Good Guys Signs is your high quality, low price solution.